Dr. Adam Hoogeveen received his doctorate of chiropractic from Palmer College of Chiropractic in February of 2010, and graduated as valedictorian of his class. During graduation he received such honors as the Clinical Excellence Award given to one clinical intern selected by the Palmer Clinic doctors, the John Connolly Memorial Award given to the “most outstanding graduate,” and being selected as president of Pi Tau Delta (chiropractic’s most distinguished honor society). He also served as class president and was a Vogt Leadership Society Scholar. Dr. Adam Hoogeveen attended the Unversity of Nebraska - Lincoln for his undergraduate studies and graduated with a B.S. in Biological Sciences. Before that he graduated from Bellevue East High School. During his time as an intern in the Palmer College Clinics he was selected to be a clinical radiology intern as well as his supervising doctor’s clinical teaching assistant. 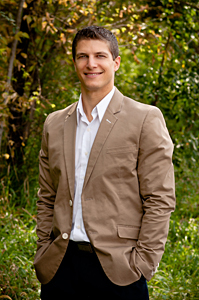 Dr. Adam is a member of the American Chiropractic Association,the Nebraska Chiropractic Physicians Association, and the International Chiropractic Association Council on Wellness Lifestyle Science. Dr. Adam has a C.C.W.P. certification with the International Chiropractic Association (ICA), which makes him a Certified Chiropractic Wellness Lifestyle Practitioner. Dr. Adam puts this knowledge to use in his chiropractic practice and his wellness coaching program. On a personal note, Dr. Adam is married to his high school sweetheart, Micaela, and they have four children together. He also enjoys his volunteer work at his church, a local Cub Scout pack, and the Fellowship of Christian Athletes. In his free time he enjoys spending time with his family, hunting, training in martial arts disciplines Krav Maga and Tae Kwon Do, playing his guitar, and reading.